Organ meats aren’t something that many Americans regularly consider eating however worldwide these types of foods have been staples for generations, and are loved by these people. Organ meat, or offal as it is called in other parts of the world consists of a variety of meats which have been traditionally used out of need, and the idea that no part of the animal should go wasted. With that being said, should we be eating this stuff, and is it safe? It seems that today with how available food is to many people that eating these organ meats would become a thing of the past, but organ meats should not be completely dismissed as they can be a part of a healthy diet. Are Organ Meats Safe to Eat? One of the most common misconceptions about many types of organ meats is that they are bad because of the role they played in the body of the animal that it came from. For example many people are afraid of eating liver, because they know that the liver is involved in the removal of toxins from the blood. They think that because of this the liver is in fact toxic itself which is simply not the case. After the liver filters out toxins from the blood, the toxins don’t just sit there in the liver, they are metabolized in to other substances and are “removed” in that manner. This means that the liver isn’t going to contain all of these toxins, and is actually pretty healthy. With that being said, it is worth remembering that just like all other food sources aren’t equal, neither are sources of offal. The quality of the meat in where it was sourced as well as the organ itself can determine how “good” or “bad” the meat is. It is basically the same idea behind feeding an animal its natural diet when trying to produce the best protein, so feed is important as well. 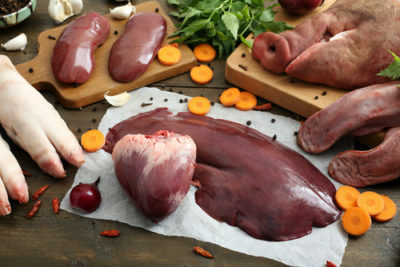 What Are the Nutritional Benefits to Eating Organ Meat? 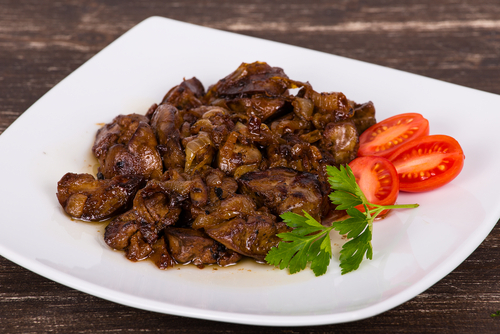 One of the biggest benefits to eating organ meats is that they are high in antioxidants, especially vitamin A. Vitamin A is important for many reasons, some of which include its role in the absorption of lipids, cell growth, cell division, skin health and immune health. Arguably vitamin A is the most important antioxidant we can get from our diet, and organ meats are a great source of this. Organ meats are also great for people suffering from anemia. Anemia is a condition where a person has low levels of iron in their blood, which is essential in the formation of red blood cells which supply the body with oxygen via the blood. Organ meats also have a lot of vitamin B-12 which is also required for the formation of these red blood cells also. How Do Organ Meats Compare to Traditional Meats Nutritionally? Again it is going to depend on what organ you are eating, but as a whole organ meats are much more nutritionally dense when compared to other meats. This makes sense if you think about it, as many of these nutrients are essential to the functioning of these organs, so the concentration of these nutrients is going to be higher in these organs. 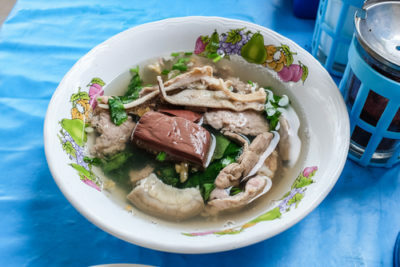 The reason why organ meats are so unpopular in the west is mainly because of unfamiliarity with the food item, and that in most cases these foods aren’t presented in an appealing manner. This is a nice way of saying the food looks unappealing and disgusting the way it is currently processed and packaged, so many people tend to stay away from these products as a result. Arguably the best organ meat when it comes to nutrition is the liver. As we know it is full of vitamin a among others including vitamin B-12, B-6 and is very low in calories. As far as nutrient dense foods are concerned, the liver is hard to beat. The heart is another excellent choice as it has plenty of vitamins and minerals as well. The heart is especially rich in iron, copper, phosphorus, selenium and other trace metals we need in our diet. It has the most coenzyme q10 out of any organ meat, and is packed with other antioxidants like vitamin B-12 too.